Many of us have seen the pink ribbons for breast cancer awareness. Before 2016 I was not aware of the gray ribbon in support of brain tumor but my daughter’s brain tumor diagnosis in 2010 when she was 27 years old changed all of that. She was married and raising two young boys while working in our family business. Two years ago we learned about the Race for Hope in Washington D.C. She and I participated in this event along with her husband and their boys in 2016 and 2017. The race is sponsored by the National Brain Tumor Society and ABC2 (Accelerate Brain Cancer Cure). We were surrounded by brain tumor survivors, friends and families. During our time in Washington D.C. we also participated in Head to the Hill; visiting Capitol Hill advocating support for increased brain tumor research funding. Six years after our daughter’s diagnosis and five years after completing treatment, we thought we were in the clear. In November of 2017 her MRI showed a change. Since then our time has been full of tests, second opinions and educating ourselves. The lack of better treatments is discouraging. 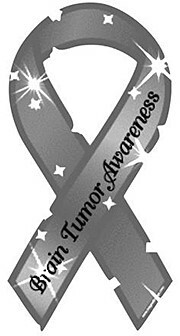 The month of May has been assigned the slogan “Go Gray in May” along with the gray ribbon to bring greater awareness about brain tumors. Anytime you see the gray ribbon, know that patients, families and friends are affected not just in the month of May but all year through. Let’s spread the awareness and find a cure.